The course puts the participant in the driving seat and presents an excellent opportunity to learn autonomously and collaboratively based on authentic contextualised learning and development needs and aspirations. BYOD4Learnings runs fully on smart devices and presents an immersive learning experience that encourages active experimentation and discovery learning. Participants will be able to connect, share experiences and learn with others from the wider community and located in different parts of the world using social media. The topics and activities provide a scaffold for learning and introduce participants to progressively more complex uses in bite-size learning chunks that trigger interest, engagement and help them to make connections to people, ideas and reflect on their own practice. In BYOD4Learning we are all learners and support each other! Let’s share what we know to grow as a community! BYOD4Learning is an open course as well as an open CPD opportunity that offers flexibility in pace, place and mode as well as flexible learning and teaching approaches. It can be used by individuals and groups at any moment in time without involvement of the original course designers or facilitators. The course has been designed to enable students and teachers to learn together in partnership through a flexible pedagogy. The course aims to empower all participants and models an inclusive and inquiry-based design for learning that enables experimentation, collaboration, creative expression and potentially trigger change in practices. Topics follow a pick ‘n’ mix approach; the course duration and mode can be fully adjusted to suit specific needs and the learning experience and process can be fully contextualised via the contribution and selection of specific scenarios by the participants themselves. The course duration can, also be adjusted. Another option would be to offer it over a series of weeks. One topic per week? Others might want to focus for a whole month or whole semester on the same topic? Course coordination, communication and collaboration can be offered and managed using different approaches. If you plan to use BYOD4Learning in any way with a group or individually, it would be great to let us know and capture your BYOD4Learning version below as a comment on this page. To participants a wide range of opportunities to explore the use of smart devices for learning and teaching in their professional context in an immersive, open, collaborative and inquiry-based environment and within a connected learning community. Reflect on how smart devices can be used within their learning and/or teaching context. Discuss opportunities and challenges which influence more widely the use of smart devices in Higher Education for inclusive practice. Trial a specific BYOD intervention for learning/teaching in own context based on an informed rationale. Please note, the above are course ILOs. You are encouraged to define your own intended learning outcomes if you learn autonomously and/or with a learning partner or group. Further topic specific ILOs are presented within each 5Cs topic page. We hope that you will enjoy the time with us and your peers and learn something that is of value for you and help you develop further. You are encouraged to keep a portfolio and capture your learning activities there. You will also have the opportunity to work towards open badges for one of the course topics or all of them. It is completely up to you and how much or how little you want to stay and learn. It is recommended to engage also with the UK Professional Standards Framework (UK PSF) during BYOD4Learning if you are a teacher in HE or teach HE in FE as this will provide a valuable guide and possible foci for your further professional development. We estimate that participants would engage with the course between 1 and 3 hours per day over the duration of the 5-day version. There will be a mix of synchronous and asynchronous activities on a daily basis, many organised by the participants themselves and some by the facilitators. If you are using the course in different ways and over a longer period of time, we estimate that 3-5 hours per week are a more realistic level of engagement, some might exceed this estimate if studying towards a badge or use this course complementary to a credit bearing course. Is the pedagogical design used in BYOD4Learning an original idea? No, it isn’t. The original developers of the pedagogical design COOL FISh (Collaborative Open Online Learning / Focus – Investigate – Share) used in this course are Chrissi Nerantzi (MMU) and Lars Uhlin (Karolinska Institutet in Sweden) which was based on an MSc dissertation project during which Problem-Based Learning was used in an open academic development context to enable collaborative learning and involved teachers studying towards a teaching qualification in HE in different UK institutions and different disciplines (Nerantzi, 2011). Chrissi and Lars developed later together and used COOL FISh for the open FDOL course available under a creative commons share alike licence and have used it so far for two iterations of #FDOL131 and #FDOL132. COOL FISh has been modified since first conceived but still reflects some features of the initial pedagogical concept of its creators. Resources from the two FDOL courses have been adapted to suit the BYOD4Learning course and also made available under a creative commons licence share alike. If you are using any parts of this course, please remember to add the attribution and link back to the BYOD4Learning site. The BYOD4Learning course idea was born a while ago, probably September time 2013. It was initially in Chrissi’s head but it didn’t stay there for long. It suddenly clicked that an open course might be an attractive offer for students and teachers to would like to learn more about the use of smart devices for learning and teaching and are keen to get started. The idea matured further during the SEDA Conference in November 2013. Then it all started happening really really quickly. The idea was discussed with Sue Beckingham, Andrew Middleton and Kathrine Jensen during, and at the end of the conference. On the way to the train station, Chrissi and Sue decided to take the idea forward and quickly had a draft plan together but no name… and were committed to make it happen. The name emerged out of Twitter chats that followed over the weekend. As soon as we had the name we started development in real time. On the way to the train station Chrissi and Sue discussed the rationale and what we wanted to achieve through this open event. The main building blocks were coming together. The event started shaping in their heads initially. Chrissi and Sue decided to adapt COOL FISh for BYOD4Learning which was developed for the open FDOL course and is available under a creative commons licence and offer BYOD4Learning under the MELSIG umbrella to help this self-funded group gain a new momentum, which has been achieved through events and a book publication linked to smart learning. Chrissi and Sue quickly agreed that the first iteration of BYOD4Learning would be a 5-day event offered in advance of the 3rd Smart Learning MELSIG event in April 2014 at MMU. Chrissi and Sue started development of BYOD4Learning on the 17th of November 2013. The basic structure was in place in a few minutes. We went for platforms that were freely available, we had used before and the basic idea was to keep it simple and model an approach that others could easily be adapted by others. FDOL resources, available under a creative commons licence, were used for this course, and adapted to BYOD4Learning and the different topics. Chrissi and Sue discussed what they and participants would achieve through this event before the development. Then they started thinking of specific topics and activities and how it would all fit together, always having in mind how they can bring individuals and groups together. The plan was also to bridge BYOD4Learning with the start of the new MELSIG book project, the related Smart Learning MELSIG event in April. Prof. Norman Jackson showed interest in our work and invited us to write a chapter based on our conceptual framework. This has been published in the Learning Lives e-Book. 1st BYOD4L facilitated iteration: BYOD4L was offered for the first time from the 27th to the 31st of January 2014. The first iteration was an open and informal collaboration between educational developers and other professionals who support academics to enhance their teaching practices from different institutions. The January 14 team page can be accessed here. 2nd BYOD4L facilitated iteration: BYOD4L was offered from the 14th to the 18th of July 2014. Five institutions joined us: Manchester Metropolitan University, Sheffield Hallam University, University of Ulster, University of Sussex and London Metropolitan University. Facilitators and further collaborators from these institutions joined as as well as further colleagues from other institutions in the UK. BYOD4L became an open CPD offer across these institutions and local events were organised during the week that brought institutional communities together. 3rd BYOD4L facilitated iteration: BYOD4L was offered in January 15, from the 26th to the 30th. The following institutions joined: Manchester Metropolitan University, Sheffield Hallam University, University of Ulster, University of Sussex, Glasgow Caledonian University, Durham University, Liverpool School of Tropical Medicine, the University of Salford, Kingston University London, Texas Educator Chat and the ICT-REV iniative. 4th BYOD4L facilitated iteration: BYOD4L was offered again in January 2016 from the 11th until the 15th. This time it was community led. Neil Withnell (University of Salford), Sheila MacNeill (Glasgow Caledonian University) and Alex Spiers (Liverpool School of Tropical Medicine) were the course organisers. They were fully supported by Chrissi Nerantzi (Manchester Metropolitan University), one of the course designers. A different model of offering open courses was used that enabled community leadership and has the potential to extend engagement, develop further capacity in offering such course as well as prolong the life of an open course. 5th BYOD4L facilitated iteration: BYOD4L was offered again in January 2017, from the 16th until the 20th. This time it was again led by Neil Withnell (University of Salford), Sheila MacNeill (Glasgow Caledonian University) and Alex Spiers (University of Liverpool) as course organisers, with extra input from the BYOD4L community. 6th BYOD4L facilitated iteration: BYOD4L was offered again in January 2018, from the 15th until the 19th. This time it was again led by Neil Withnell (University of Salford), Sheila MacNeill (Glasgow Caledonian University), and Alex Spiers (University of Liverpool), with the addition of facilitators Debbie Baff (Swansea University) and Suzanne Faulkner (University of Strathclyde). The 5C’s were expanded on (see here) to bring in another dimension to the course. If you are interested to organise a future BYOD4L course, please get in touch with Chrissi at c.nerantzi @ mmu.ac.uk (without the spaces). The idea is to make BYOD4Learning a self-sustainable flexible learning platform that could be used by individuals and groups, any groups at various moments in time with or without local or more distributed facilitation. As there is literally no content, the stories or scenarios used, can be picked depending on the context and learner community spaces can be set-up using a variety of social media, such as Twitter, Google + community, Facebook etc. Some groups might also want to co-ordinate their discussions and collaborative tasks via institutional VLEs and link out to BYOD4Learning. This is absolutely fine also. Others might consider offering it in different languages. The opportunities are endless. For some ideas, please check out Adapting BYOD4L. We would love to hear how you are using BYOD4Learning. So please get in touch, if you do. Please note: this course has not received funding or sponsorship from any source and relies 100% on the good will of all collaborators and partners for which we are extremely grateful. Only freely available social media tools have been used to design something that anybody else could design too. A special thank you to artist Ellie Livermore for designing the BYOD4Learning artwork including our open badges and making it available under a creative commons licence and our reviewer Dr Cristina Costa for her valuable comments and suggestions. 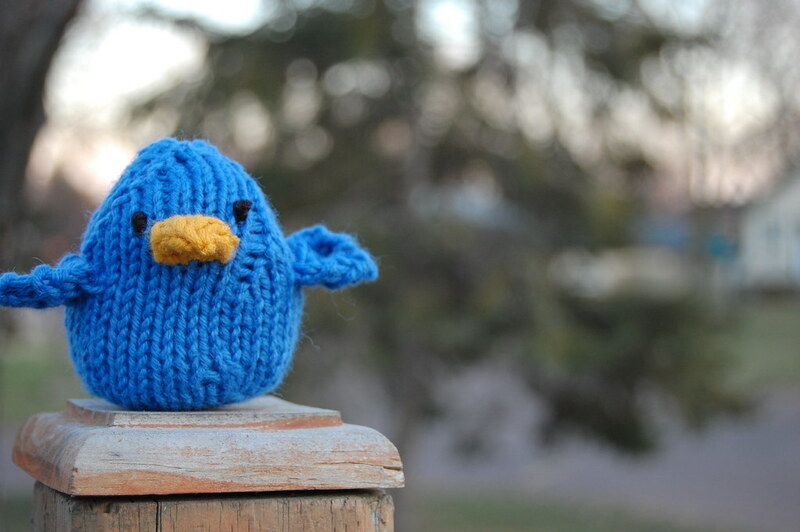 We would also like to thank Brian Kopp and his lovely photograph available under creative commons of the knitted Twitterbird which we have used to promote our #byod4lchat (a pattern for the knitted Twitterbird is available here and another one here – thank you Emma Duke-Williams for sharing). A thank you also to our volunteer facilitators from different institutions and everybody who participated in the filming of the scenarios and commented during the development phase. We wouldn’t be able to offer this course without them. Please check out the team page to find out who the facilitators of each iteration are. Nerantzi, C. (2011) “Anyone there?” Online Problem-Based Learning within Academic Development, MSc Dissertation, Edinburgh Napier University (UK).